A scablands geologist whose theory finally won out. Throughout the 1920s, University of Chicago geology professor J Harlen Bretz spent each summer exploring a vast, desert-like region of Washington state he had dubbed the “channeled scab-lands.” Bretz, PhD 1913, was intrigued by geologic features of this bone-dry landscape, features that seemed to have been created by swiftly flowing water. After two summers of fieldwork, he concluded that a cataclysmic flood had carved the deep coulees, dry waterfalls, giant potholes, and tracts of exposed basalt. University of Chicago geology professor J Harlen Bretz. With a handful of Chicago graduate students, Bretz returned to the scablands every summer from 1922 to 1931, writing additional papers to support his flood hypothesis. Yet more than four decades passed before his theory gained acceptance. Now the tortured landscape he studied and mapped is on its way to becoming a federally designated scenic region by virtue of its geologic conception. This past March and April, both houses of Congress passed, and President Obama signed, legislation to create an Ice Age Floods National Geologic Trail, beginning in western Montana, crossing northern Idaho, and winding through eastern Washington, down the Columbia Gorge, through Portland and the Willamette Valley, all the way to the Pacific Ocean at Astoria. Like other national trails (Lewis and Clark, Santa Fe, Old Spanish), the Ice Age Floods Geologic Trail will include information centers, museums, highway signs, and other educational components in four Western states to educate tourists about the flood waters’ ancient path. Without Bretz’s dogged determination, others wouldn’t have recognized the scablands as the unique site that it is. The unlikely hero of the Ice Age floods story was a rough-around-the-edges geologist whose stubborn self-confidence aggravated many within his profession. Bretz’s abrasive personality made other geologists reluctant to accept his theory, which smacked of biblical catastrophism and ran counter to key geological tenets. 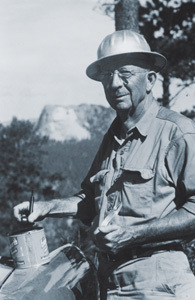 The son of a Michigan farmer, Bretz graduated from Albion College in 1905, then taught high-school biology in Michigan for a year before moving to a high school in Seattle, which had “almost virgin territory,” unstudied land where he could make contributions to geology. Intrigued by western Washington’s glacial landscape, he spent his free time exploring the Puget Sound. R. D. Salisbury, head of Chicago’s geology department, urged Bretz to return to the University to teach. In Hyde Park Bretz had freedom to pursue his Socratic teaching style and to lead field trips both locally and far afield, sometimes taking his wife, Fanny; son, Rudolph; and daughter, Rhoda. When a 1922 trip to the Washington Cascades was cut short by logistical problems, Bretz found himself with four restless students and a few remaining weeks of summer. A friend from Spokane lent Bretz his Model T, and the group instead toured the ragged basalt terrain west and south of town. This excursion led to a 1922 paper suggesting that glacial streams had emerged from massive ice fields north of Spokane, flowing for hundreds of years at the end of the last Ice Age. These swiftly flowing streams, Bretz contended, had shaped the region’s unusual features. Bretz’s paper was well received. But after spending two more months in the scablands during 1923, he reached a strikingly different conclusion. In his next paper, Bretz argued that glacial streams alone could not have carved coulees 1,000 feet deep, deposited gravel bars several hundred feet high, or left behind potholes the size of artillery craters. Instead, he theorized, an Ice Age flood of cataclysmic proportions had roared across the landscape. Rather than taking hundreds of years, within days or weeks this deluge had changed a landscape of rolling hills and gently flowing streams into a ragged terrain of gullies and potholes, dry cataracts and towering basalt buttes. At this point, 100 years after the discipline had laid its roots, geology had attained some credibility and established that Earth’s features were the result of hundreds of thousands, even millions of years of erosion, mountain building, and the rise and fall of great seas. For Bretz to claim that a single flood event could so drastically change the face of a region was the scientific equivalent of heresy. Yet he stood by his theory. Between 1922 and 1931 he wrote 15 papers, each building upon the others and melding a multitude of field observations into evidence that supported his claims. At first other geologists ignored his findings. Then they developed alternate theories more in line with the laws of uniformitarianism, the idea that the slow forces observed today were at work millions of years ago and accounted for all of Earth’s geologic features. At a 1927 meeting of the Geological Society of Washington, DC, Bretz’s opponents attacked him in what some of his contemporary geologists called “a lynching.” Still, he did not back down. After a few months suffering from depression, Bretz wrote his critics from the meeting, asking for details and clarification. He then published a paper contrasting his theories with theirs. Other geologists supported him, giving him the will to continue his research, and his students remained admirers. There was, however, a question Bretz could not answer: where had so much water come from? According to a mathematician’s 1925 calculation, the amount of water needed to carve the scablands was immense: 39 cubic miles of water flowing past Wallula Gap, a major landmark along the flood path, each day. Even a sudden melting of all the ice north of the scabland region could not have produced so much water. But because the evidence supported his theory, Bretz regarded the issue of where the water came from as merely a detail to be answered in time. Even given Pardee’s evidence of a great ice-dam failure, some geologists still refused to accept the idea that a flood had created the scablands. It was not until 1957, for example, that Richard Foster Flint, U-High’18, SB’22, PhD’25, finally dropped his own theory about the scab-lands, which proposed an obstruction in the Columbia Gorge had forced water to back up into the scablands, from his popular geology text. Others became convinced earlier, especially after Bretz—who officially retired in 1947—wrote a paper based on a return trip to the region in the early 1950s. Surveying and excavation for irrigation projects had revealed vast gravel deposits, massive gravel bars, and huge ripples similar to those in Montana. A group of highly regarded geologists toured the scablands in 1965, where actually seeing the geological features convinced the former doubters. They sent Bretz a telegram reading: “Greetings and Salutations. We are all now catastrophists!” In 1972 NASA and the U.S. Geological Survey released the first satellite pictures of Earth, clearly revealing Bretz’s scabland channels, identical to those shown on maps he had drawn in the 1920s. Also in 1972, Mariner 9 spacecraft photos of Mars revealed that the planet’s mysterious “canals” were scab-land channels, produced, NASA scientists theorized, by massive flooding. In 1979 the Geological Society of America awarded Bretz, then 97, its Penrose Medal. He died not quite two years later. Now the U.S. government has approved the national trail—a trail he helped to blaze. John Soennichsen is the author of Bretz's Flood: The Remarkable Story of a Rebel Geologist and the World's Greatest Flood (Sasquatch Books, October 2009).